Mob Enforcer is a bomb specialist. Let’s look a this brief guide and see what she has to offer to your team. Basic Ability: Dirty Fighting – Deal Physical damage to target enemy with a 80% chance to inflict Defense Down for 2 turns. Unique Ability: Underworld Moxie – Mob Enforcer gains 15% Maximum Health Up per living Scoundrel ally. In addition, whenever an ally falls below 30% Health, there is a 55% chance Mob Enforcer will gain Offense Up for 2 Turns. The Mob Enforcer is a tanky character that can apply defense debuff to your enemies. She has a built in bomb that detonates in 2 turns. Bombs actually do surprising damage, but it requires 2 turns to do it. Most battles don’t go past 3 turns. That means your damage will suffer in the first 2 turns. Burst damage is much better as of now. Unless they create a skill that allows you to detonate bombs, bombs will always be on the back foot of most players. 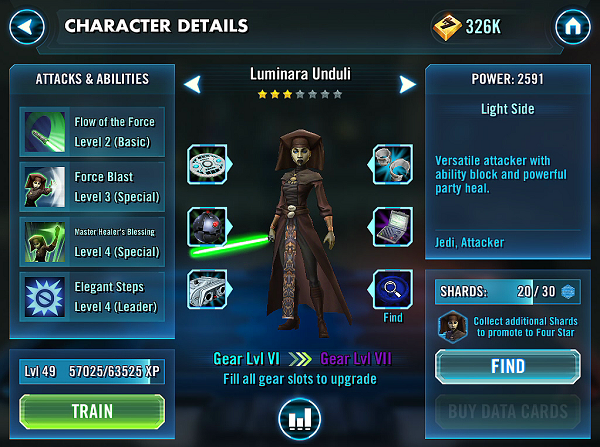 I suggest you put her in the back burner for now and wait for updates and see if EA changes anything.